Hugh and Ettie’s first home was at Kangaroo Flat in a house which was later referred to in the family as “the old kitchen”. 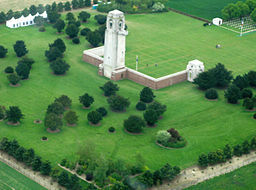 As late as the 1990s some building and garden remains could be seen. A granddaughter and great-granddaughter of Hugh and Ettie at the site of the “the old kitchen” c1997. Presumably there were other rooms than a kitchen. 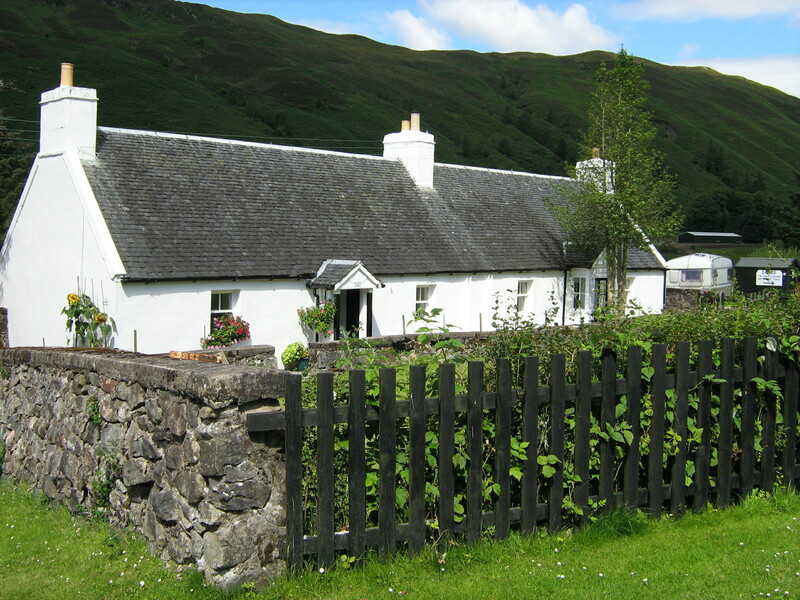 This property was owned by Kenny McLean. When Hugh and Ettie left the property, the house was bought by Hugh’s half-sister, Ellen Iverson and her husband George Stubbings and moved to their property at Burnt Blanket. Perhaps it was during this period that they lived at Koreelah. They had built a house at Beaury Creek but Kenny McLean and his wife were living there. When Hugh and Ettie had to leave Koreelah, they moved in with Hugh’s half-brother Donald Iverson’s family at the Little (Tooloom) Falls. Eventually they were able to move to their house at Beaury Creek and lived there for many years, although with a bit more to-ing and fro-ing. 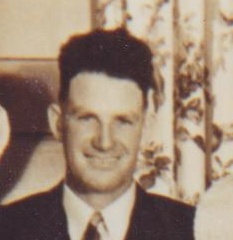 During World War 2, oldest son Allen was married and farming nearby, next son John, also married was farming in Queensland. 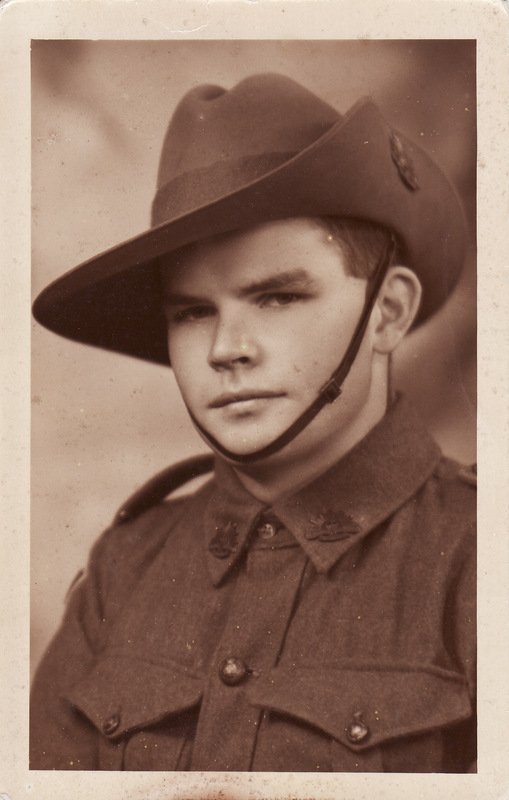 Two sons, Hughie and Lach, were in the army and the youngest son, Ewan, too young to enlist, was at home with his parents and once he left school working on the dairy farm. Ettie’s brother Emerald was also living with them and lending a hand. He was not in robust health, having only one kidney as a result of having contracted meningitis as a child, in a tragedy which claimed the lives of five of his siblings. 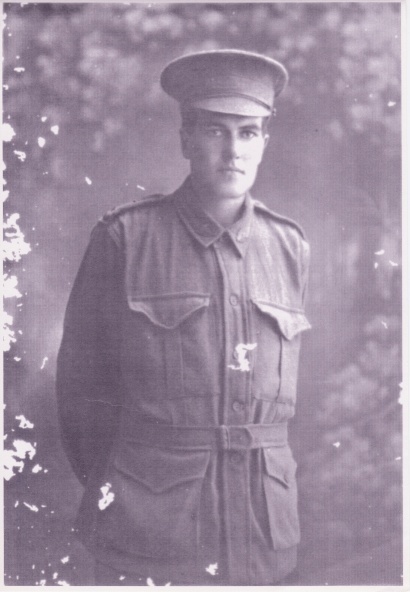 The oldest daughter, Bell, was living in Newcastle where her husband, Doug Guest, was working in what was considered an essential industry, namely ammunition manufacturing. Meanwhile Hugh and Ettie had been busy making sure that Hughie and Lach would have a livelihood when they came back from the war and had purchased a property for each of them. The property secured for Hughie was “Grimstead” essentially across the road at Beaury Creek. 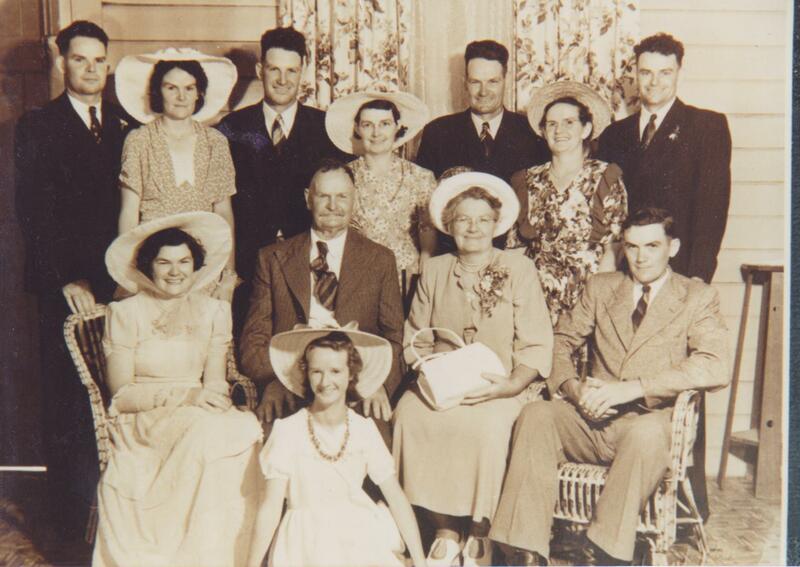 The family moved over to run the dairy farm there until Bell and Doug moved back from Newcastle, soon after which Hugh, Ettie and the children still at home moved into the property on the Falls Road which had been secured for Lach. People obviously had fewer possession and different expectations in those days. May went to school in Urbenville that day and the first she knew of the move was as she was riding home from school and was informed by a local family she came across that she was to go to the Falls Road property instead of “Grimstead”. She arrived there to find her parents settling in and trying to build a fire. After some time, they must have moved back to Beaury Creek. It no longer stands, having been demolished to provide some of the mismatched building materials for the house at “Windy Hill”. Hugh wanted to name the house in the Gaelic he had heard his grandfather speak but was unable to remember the words which would convey the idea of a windy hill. I was only ever a visitor to the Windy Hill house. I never lived there but to me it is where my mother came from. For her, the house at Beaury Creek was her childhood home, which she describes fondly as a beautiful farm. She is working on a map of it. There are other versions of the order in which Hugh and Ettie’s moves happened. This is May’s version as told to me. 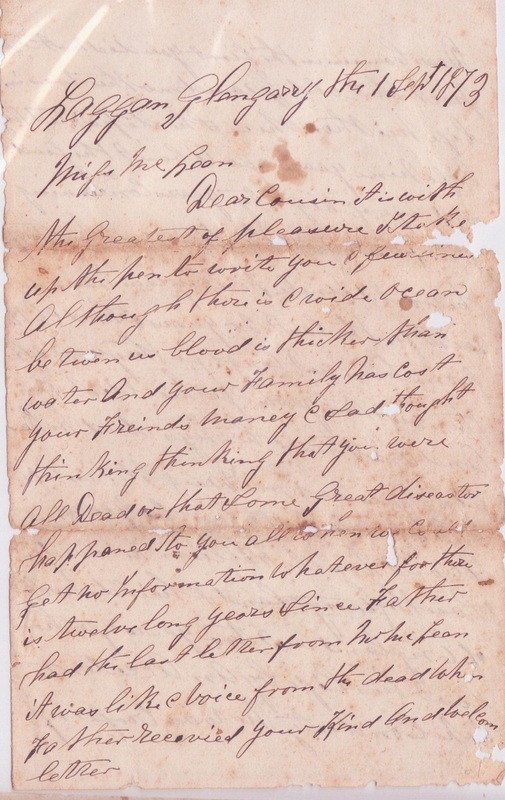 …when Father received your kind and welcome letter wrote Matthew McLean to his cousin, Ann McLean in 1873. 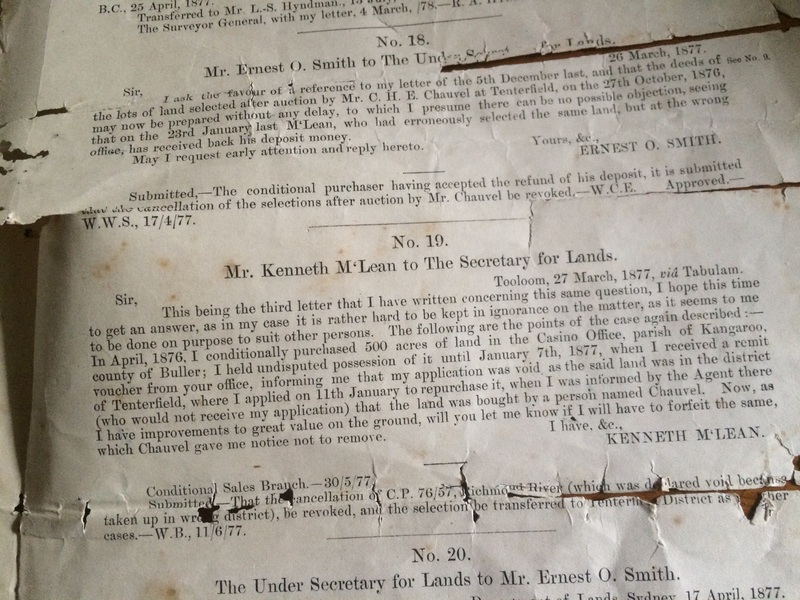 That letter, and another written in 1875, were kept by Ann’s nephew and my grandfather, Hugh McLean Mulcahy, and when I took possession of them, they were indeed like a voice from the dead. With their help much of the lives of Matthew and Ann’s aunts and uncles has been pieced together and some interstate and international connections have been made along the way. What has resulted is a typical story of 19th century Scotland, of a family whose members spread across the globe looking for new opportunities and better lives. he/she appeared to live with his/her parents and did not mention a spouse or children of his/her own. My suspicion from the style was that the writer was male. 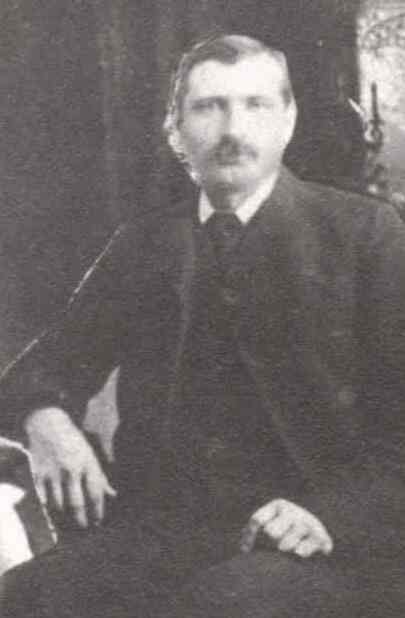 After piecing the clues together, I eventually settled on the writer’s identity as Matthew McLean (1842-? 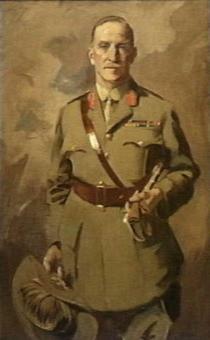 ), son of Neil McLean and Isabella Ross. Dear Cousin, in the first you did not expect that old Grandmother was in life. Neither she is. She departed this life nine years ago about the good old age of eighty years. Concerning your friends in the different parts of the world, Uncle Finlay is in Canada West for the last 20 years. I had a letter from him not long ago. They were all well then but two years ago his oldest son and another of his boys died. He has six sons and one daughter in life and he is a farmer for the last 20 years. About Uncle William he lived in South Shields (in the) North of England but two years ago he lost his life by an accident. While on duty he was crossing the railway line of the work that belonged to his employer. An engine and five wagons passed over his body. He only lived for fifteen minutes after the accident. His oldest son is an engineer to trade and is always going to sea. He is married and resides in the city of London. His second oldest son is a ship carpenter to trade and goes to sea. His youngest son is a cartwright. One of his daughters married in South Shields. About Uncle Alexander, he is in Australia but we get no account whatever of him. He never writes to us. Three years ago I fell in with a man of the name of Cameron, a native of Lochaber. He was newly home from Australia. He frequently met Uncle in the market town there. Likewise he has done well. This Cameron knew Uncle before ever any of them went to Australia. Uncle’s good father is in life and keeps the Glengarry post office. Two of his good sisters are at home and the rest of the family are scattered here and there. They are Rosses to name. Dear Cousin, my parents are in life and strong yet only Mother is greatly troubled with headache….I have one brother. He is joiner to trade and works in the city of Glasgow for the last two years and unmarried. Such was the isolation of our early Australian settlers that news of a grandparent’s death took nine years to be received and Ann would have had no idea exactly how many cousins she actually had. It’s hard to imagine why Ann or her parents hadn’t made contact with their extended family for so long but maybe they were so consumed with the daily struggle for survival that faraway relatives didn’t enter their thoughts very often. By 1873, Ann’s family was living near the Tooloom gold diggings in northern New South Wales and subsistence-farming which was a hard life. I thought from the letter that I was dealing with the Ross side of the family because of the mention of Uncle Alexander’s family being Rosses, although the generations didn’t add up. If Alexander was an uncle of Ann, then he should have been a son of the grandmother who was mentioned. So how could Alexander’s father then be keeping the Glengarry post office? Why didn’t the writer refer to the postman as Grandfather? This was the first red herring because Uncle Alexander Ross married Margaret Ross and the “good father” referred to in the letter was actually Alexander’s father-in-law. I now know that “good father” is a Scottish term for father-in-law but I didn’t know that then. These mysteries were solved when I came into contact with a lady in Victoria who was a descendant of Alexander and who had done considerable work on the Ross family including visits to repositories in Scotland. Jan was able to fill in many gaps for me and we have been partners in Ross research since then. Alexander settled near Caramut in Victoria and had a large family, although reports of him having “done well” were exaggerated. By all accounts he was always fairly poor. Uncle William was not too hard to track down. 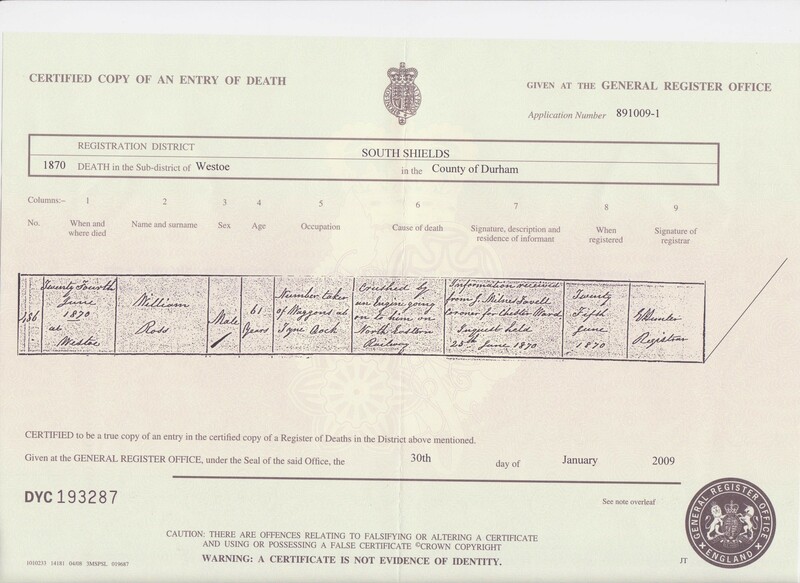 I ordered a death certificate for a William Ross who was the right age and whose death was registered in South Shields at the right time and he had indeed died after being run over by a train. I was also able with the assistance of a local researcher to find a small mention of the accident in the “Shields Gazette”. Uncle Finlay was the hardest uncle to find. I was able to find fairly easily in the Canadian census of 1871 a Finlay Ross who was born in Scotland, was a farmer in Canada West (roughly equivalent to what is now the southern part of Ontario) and had a family of six sons and one daughter alive. 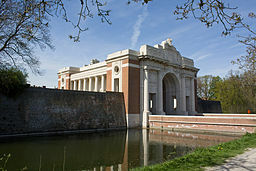 That Finlay’s 1904 obituary stated that he was from Inverness-shire but no other Canadian records mention his parents’ names or his birthplace; nor does there appear to be any record of the deaths of those two sons who died around 1871. They must have been dead before the time of the 1871 census and possibly even before civil registration began there in 1869. While Matthew McLean’s memory of the timing of events is fairly accurate, he is sometimes “out” by a year or so. 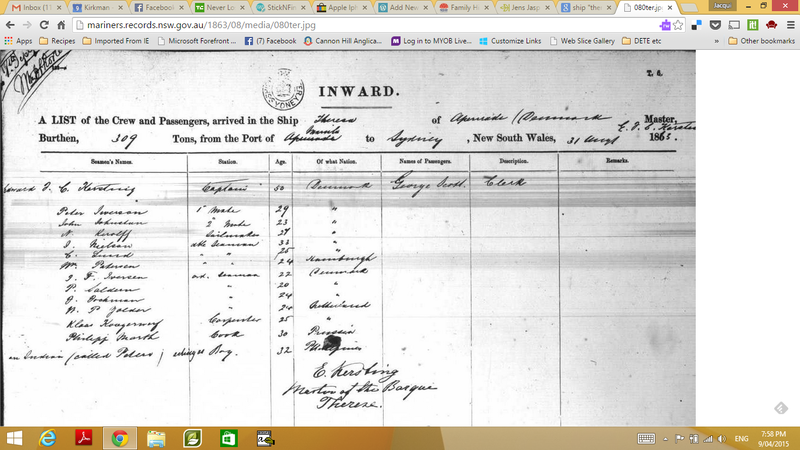 Now the Finlay Ross who ended up in Ontario did not go directly from Scotland to Canada. He spent a few years in the Channel Islands which is where he met and married his wife, Marguerite Le Cocq (Marie) Houguez. A record exists in the Priaulx Library in Guernsey of the baptism of Donald Lawrence Ross, a son of Marguerite and Finlay, son of Donald of Kilmarnock. Kilmarnock is a long way from Inverness-shire so if Finlay was really from Kilmarnock, then he is not the Finlay I’m looking for. However Kilmarnock doesn’t tie in with his obituary’s mention of Inverness-shire and I suspect that the priest in Alderney accidentally wrote Kilmarnock instead of Kilmonivaig, which is the name of the parish which includes the town of Laggan. 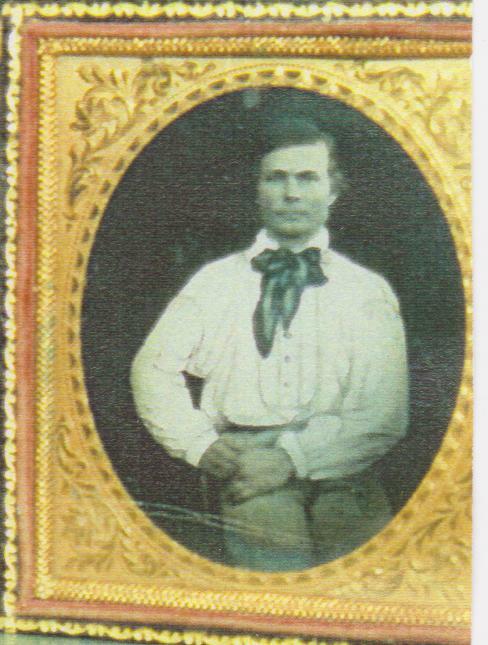 This is probably the eldest son who died around 1870 because none of Finlay’s descendants had any knowledge of him. 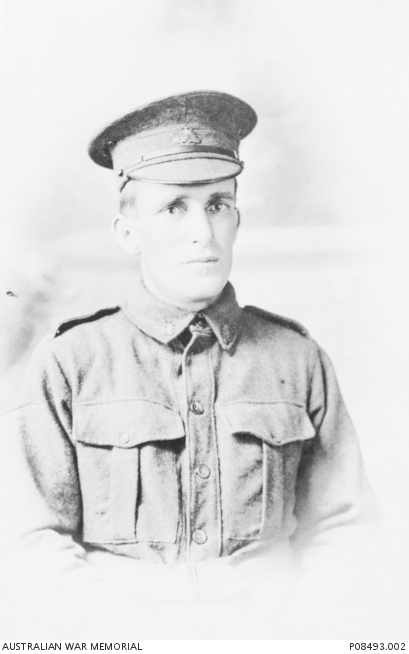 Admittedly the evidence which links the Finlay Ross who was a brother to my great-great-grandmother, and the Finlay Ross who died in Huron County, Ontario in 1904 is circumstantial but I think it’s the best I’m going to get, so I have decided to claim the Finlay Ross from Huron as our Finlay. The fact that Matthew and Ann were both McLeans was another red herring. They were cousins because their mothers, Isabella Ross and Catherine Ross respectively, were sisters – sisters who coincidentally married McLeans. Isabella was “found” because her husband, Neil McLean of Laggan Locks, was the informant listed on his mother-in-law’s death certificate. Isabella’s baptism has not been found but census records show that she was born in England. Donald Ross, the father of this family, was for at least a short period a member of the Berwickshire Militia so perhaps the Militia was posted in England at the time of Isabella’s birth. Neil McLean was the Lock-keeper on the Caledonian Canal at Laggan as was his father before him and his son, Matthew, after him. All the family members mentioned in the letters are now accounted for except for Finlay’s other son who died around 1870. Research also turned up another aunt, Ann, baptised in Kilmonivaig in 1821. She disappears from the records after the 1851 census and the fact that she isn’t mentioned in the 1873 letters leads me to suspect that she had died some time ago and that fact was known to her extended family. However I could be wrong and I would be delighted to be contacted by one of her descendants. If Scottish naming patterns are considered, there really should have also been an uncle named Donald but we have found no trace of one and was it just coincidence that Catherine and Finlay both had sons named David? By all rights Catherine’s firstborn son should have been named Donald, John or Finlay after his father or a grandfather, not David. Of course, I already knew what had happened to Catherine, my great-great-grandmother. I knew that she had a son by Donald McLean before they were married, that they married when that son was about two and immediately set sail for Australia. 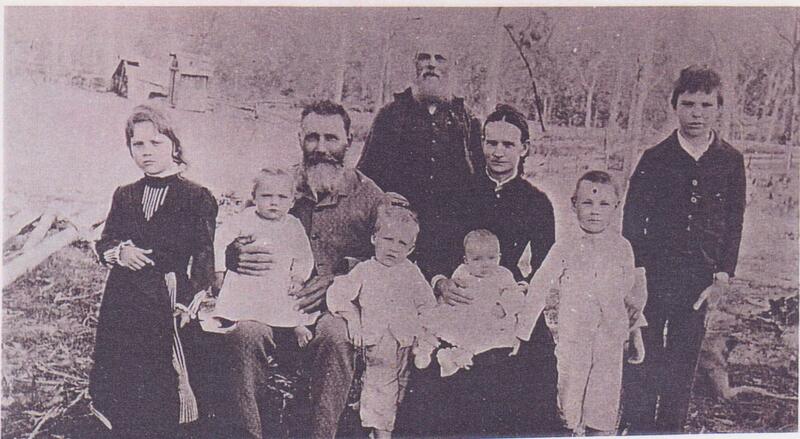 They arrived in 1837 on the Midlothian, lived and worked in the Hunter Valley for some years before settling in the Tooloom area of northern New South Wales and eventually had a family of ten children. 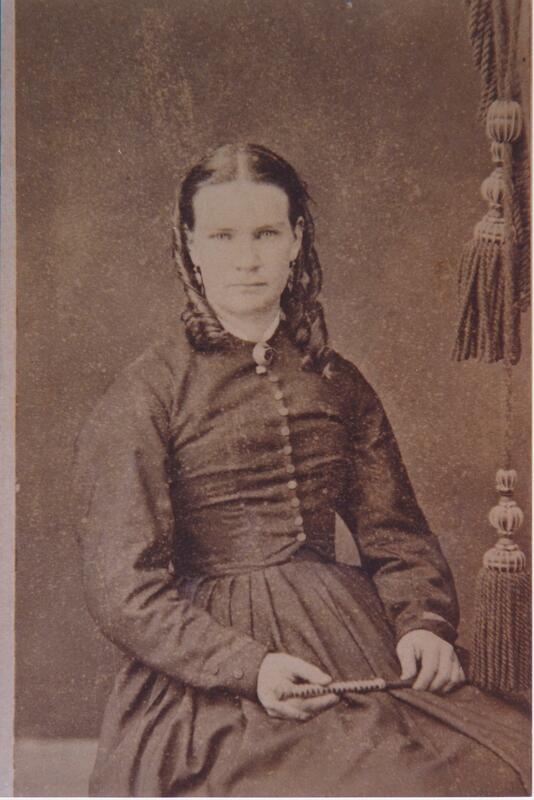 Catherine died on November 6, 1873, probably as the letter from her nephew was en route. Jan, the descendant of Alexander mentioned above, had found the record of the Kilmonivaig Kirk Session where Catherine appeared before the minister and the elders to explain how she came to have an illegitimate child. She had gone to Drynoch on the Isle of Skye as a servant to a shepherd. In Drynoch she met Donald McLean and their son, David, was conceived. The result of the Kirk Session was that the parish in which Drynoch was situated (Bracadale) was to be informed of David’s existence. It obviously took some time but eventually Catherine and Donald were persuaded or decided to marry. So when Ann Matheson, the Grandmother mentioned in the letters, died in 1863, only one of her children was living in the same country as her. As another part of the Laggan letters says, It’s a great country for emigration now, thousands leaving the British shores every day. The story of the Ross family is a perfect example of this. A story passed down by a Canadian relative said that Finlay had warned a brother who was thinking of emigrating to Canada that the farming life there was very hard and he would be better to try Australia. 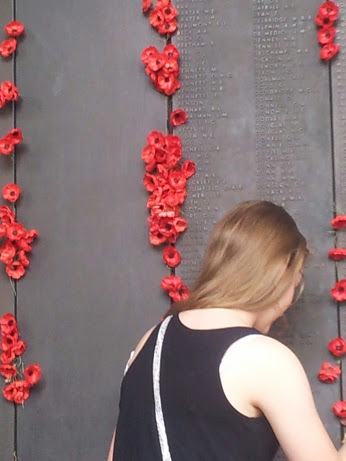 Alexander, the presumed recipient of that advice, may not have found a much easier life in Australia but he and his sister, Catherine, both founded large Australian families who contributed to the building of Australia. With thanks to Jan Lier and Aileen Fisher for invaluable mutual research support. Jens Jasper Iverson and Jacob C.W. Nielsen were good friends. They sailed the seas together, jumped ship together and lived and worked together for 60 years. For the rest of their lives, Jacob followed Jens’ example. Although Jacob was the elder, he would buy exactly the same things Jens bought. Jacob even bought the same size clothing, although Jens was much taller. The only thing Jacob couldn’t match Jens in was a wife. Jens married my great-grandmother, Mary Mulcahy (nee McLean) in 1885. She was a widow with three young boys who must have been glad of the security another marriage offered. Jens and Mary made a home at “Swallows’ Nest” on the banks of Tooloom Creek in northern New South Wales and Jacob lived on their property for the rest of his life, outliving Jens by seven years and living until he was 100. Jacob had been jilted by his fiancée and he wore the ring he had bought for her. Did he never marry because he remained heartbroken and found no one who could measure up to her or was it the shortage of women in the area which caused his continuing single status? Jens, Mary and Jacob lived a very settled existence, working hard on “Swallows’ Nest” to survive as subsistence farmers and to raise the £5 lease payment which was due each year. The kitchen had walls and floors of slab and an open fireplace where Mary cooked with a camp oven. The pantry, eight feet wide and the length of the house, was lined with shelves of preserves. Mary’s grandchildren remembered that as children they would run to see Grannie’s pantry as soon as they arrived for a visit. There was a large orchard with stone fruits, grapes, citrus, quinces, pomegranates, Japanese raisins, mulberries, persimmons, apples and pears. Corn was interplanted with melons and pumpkins. It was ground for porridge and corn bread and used to feed the fowls. They grew their own arrowroot and tobacco. Watering was by bucket from the creek but there were no fruit flies or other pests to contend with as these had not yet arrived in the area. There were cows for milk, cheese and butter for the family and some butter for sale. They always kept a couple of pigs to slaughter in winter and then cured the pork for hams and bacon. They ran 25 sheep and may have sold some wool. Any supplies which they could not produce came by bullock wagon from Boonah twice a year. 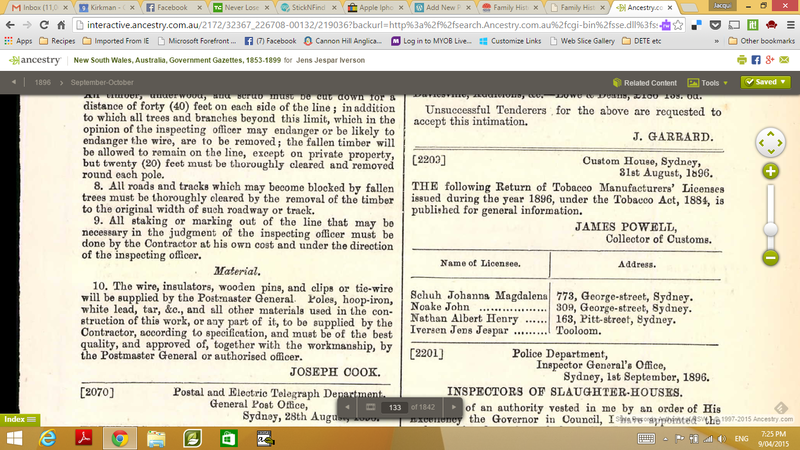 Was this the life Jens and Jacob had in mind when they deserted their ship, the “Theresa”, when it was in port in Sydney in 1863? Did they dream of life on the land or were they hoping to strike it rich on the goldfields? While the first flush of the gold rush was over, there were still discoveries being made on a regular basis. Although the “Theresa” was not a passenger ship, they must have noticed the wave of immigrants arriving in Australia. Perhaps the life of a Danish seaman was not a happy one. Family stories say that Jens’ brother, Peter, jumped ship in America. 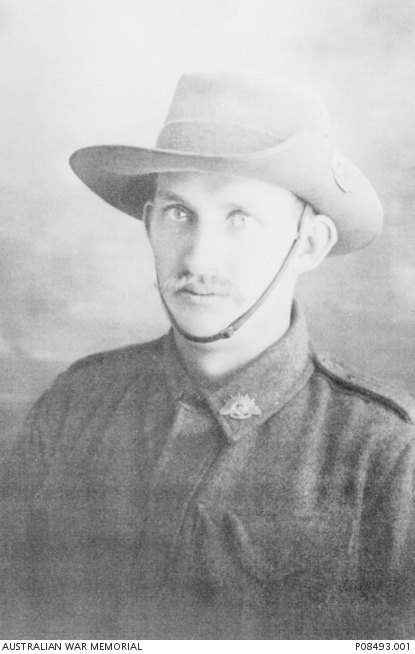 Jens’ final resting place in Warwick, Queensland, was a long way from his birthplace in Denmark. 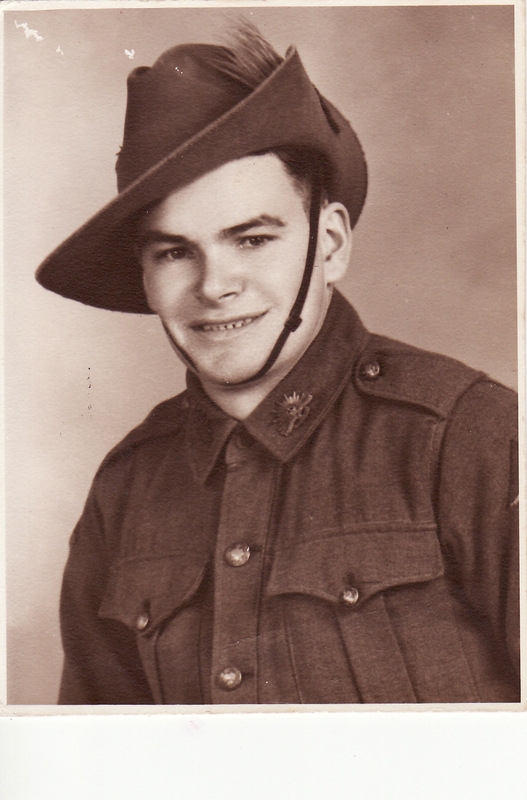 My mother was born in northern New South Wales. The various branches of her family tree met there because the country began to open up for timber-getting, farming and grazing in the 1830s as settlement gradually spread away from the areas first settled by the British around what is now Sydney. 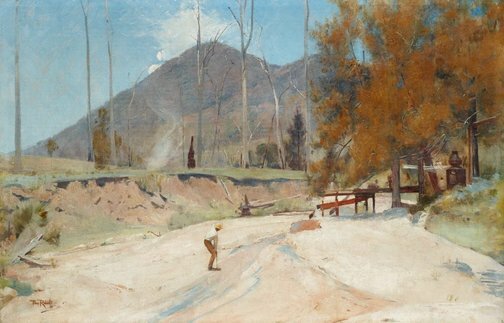 Then in 1857 gold was discovered at Boonoo Boonoo (pronounced Bunna Bunnoo by the locals) and in 1858 at Timbarra, in 1859 at Tooloom and Pretty Gully. The early history of the area is covered in Isabel Wilkinson’s brilliantly detailed but sadly unindexed book, “Forgotten Country” published in 1980. More recently (2009) Brett Stubbs has published “The Gold Digger’s Arms. Pubs of the Upper Clarence River district, New South Wales”, a useful and interesting read about (unsurprisingly) pubs, their owners and lessees and their local area history. 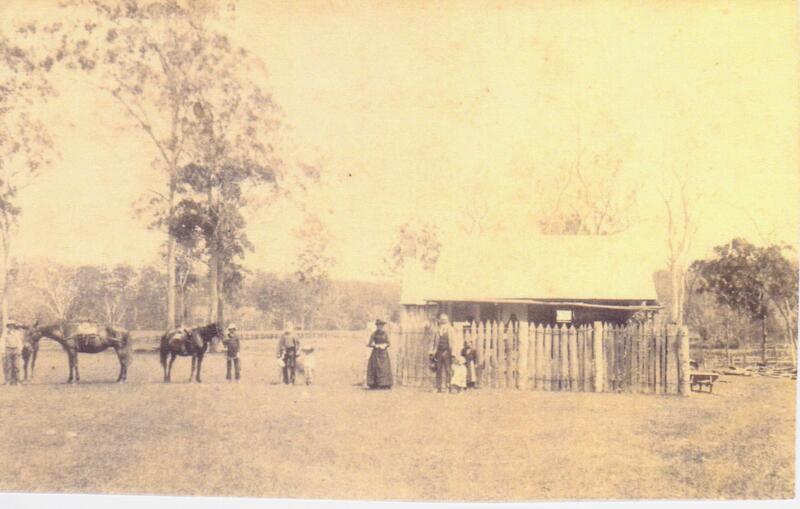 Mum’s Payne ancestors were convicts who received land grants in the Hunter region once they had served their sentences. 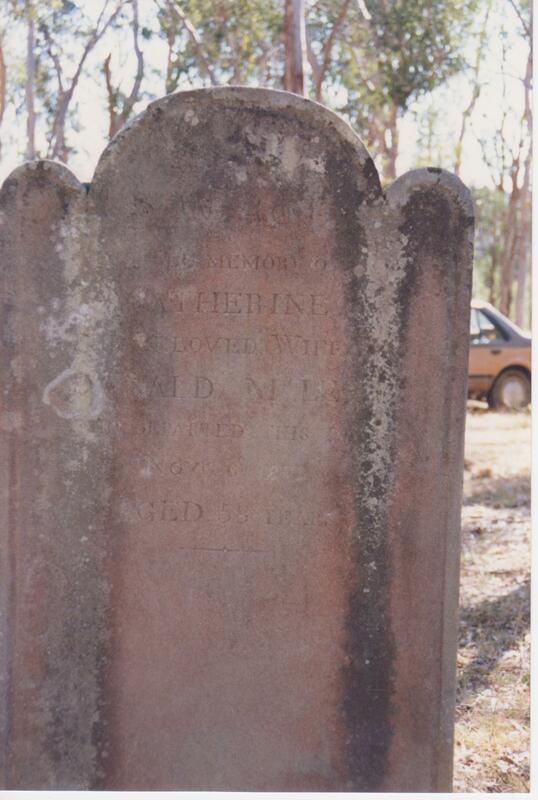 John Payne and his wife, Mary Ann Sophia (nee Merrick) left the Hunter around 1870 and worked their way through New South Wales with children born in Inverell in 1871, Tingha in 1874, Pallamallawa in 1876 and 1878, Bininguy in 1880 and Narrabri in 1884. 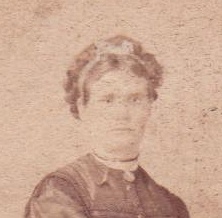 Mary Ann Sophia died in Narrabri in 1885. Their oldest son, John Edward (Jack) was settled in the Upper Clarence by the time of his marriage in 1889. Gold was still being discovered and in fact there was a new boom in the early 1890s. 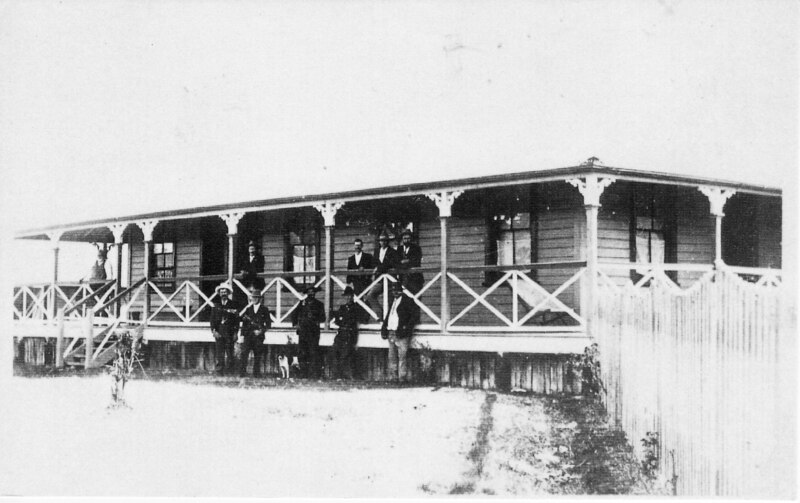 The Paynes capitalised on this boom by opening the Tooloom Hotel in 1894. Wherever the Payne family was living in 1889, it was obviously not the spacious establishment of the Tooloom Hotel for the story goes that when “Big” John Payne (so called because he weighed 23 stone) married for the second time in September 1889 and brought his new bride home, his son and daughter-in-law, married only two months themselves, were required to vacate the only double bed in the house. 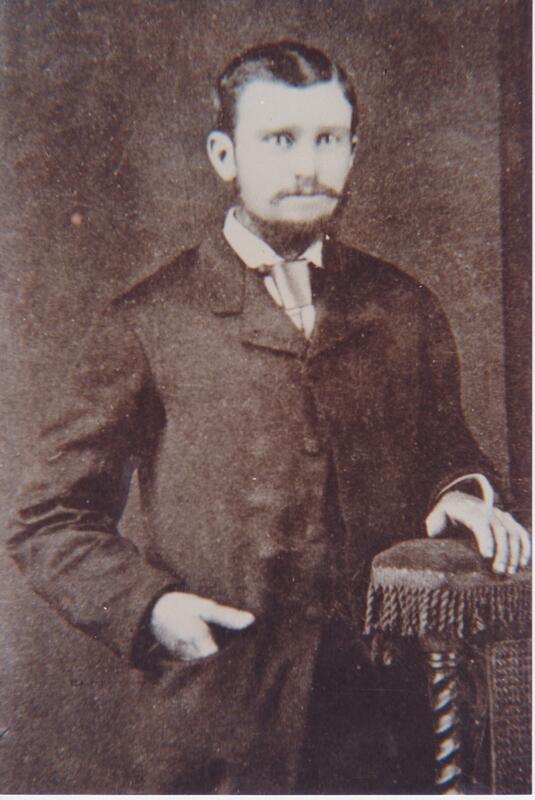 There are some mysteries surrounding George Smith but he was born in Buckinghamshire and arrived in Australia in 1857, maybe in the wake of the gold rush. He married Eliza Jane Merchant whose family switched from laying railways in England to digging for gold on the other side of the world. 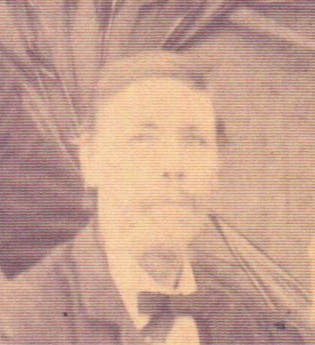 Their daughter, Mary Ann (Annie), married Jack Payne. 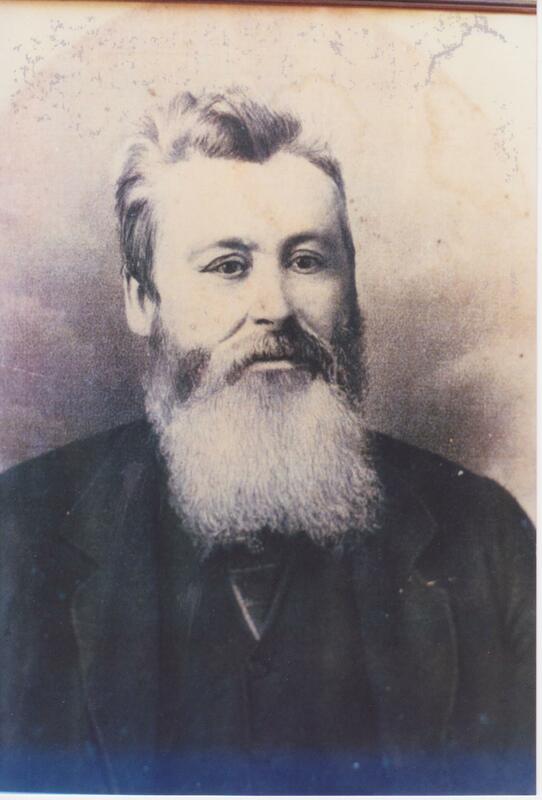 Donald McLean and his wife Ann Matheson arrived in Australia in 1837. The highland clearances and economic changes in Scotland had impacted their families on Skye and in Inverness and the newly married couple joined the wave of immigration to Australia, America and Canada. 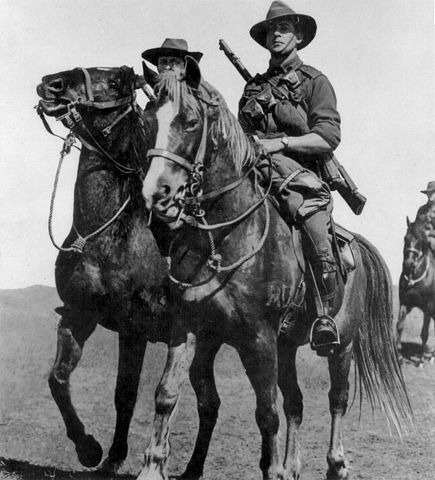 Their daughter, Mary, married John Mulcahy the son of Irish immigrants who had also travelled north from the Hunter region. Farming opportunities and gold brought these families to the north of the colony. The Tooloom gold diggings was the place where in 1893 a 17-year-old Hugh Mulcahy (son of John Mulcahy and Mary McLean) heard the news that Jack Payne’s wife, Annie (nee Smith), had given birth to a daughter. No doubt he congratulated the proud father but can’t have known that he would one day marry that daughter. The 35-year-old Hugh married the 18-year-old Ettie in 1911, and they were my grandparents.